Chevy Chase was born in Lower Manhattan, New York, U.S., on October 8, 1943, is an American actor and comedian. 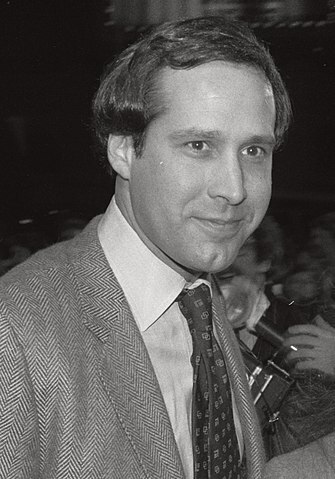 Young Chevy Chase began his acting career as a part of the Saturday Night Live (1975-1976). He made his big screen debut in the comedy movie The Groove Tube (1974) in role as The Fingers / Geritan / Four Leaf Clover. Chevy's breakthrough performance came as Lieutenant Tony Carlson in the comedy mystery thriller film Foul Play (1978), for which he was nominated for two Golden Globe Award, for Best Actor and New Star of the Year. He played Pierce Hawthorne in comedy television series Community (2009–2014). He was one of the original cast members of Saturday Night Live. He plays drums, piano and saxophone. He was married to Susan Hewitt (1973-1976) and to Jacqueline Carlin (1976-1980). He married Jayni Luke in 1982, they have four children. He is an environmentalist and charity fundraiser. He hosted the Academy Awards in 1987 and 1988. Best friends with singer Paul Simon. Any good actor has to have a good sense of humour, too; they have to be able to manipulate people. I was a young, new, hot star, and I had this unbelievable arrogance. As time went on, the strident narcissism and arrogance slowly diminished. But I was definitely there. I'm older now. And a big crybaby. I did very well when I was younger, and I am fine. I come from a much freer kind of performance thing, where I rely on my own improv and my own sense of humor.